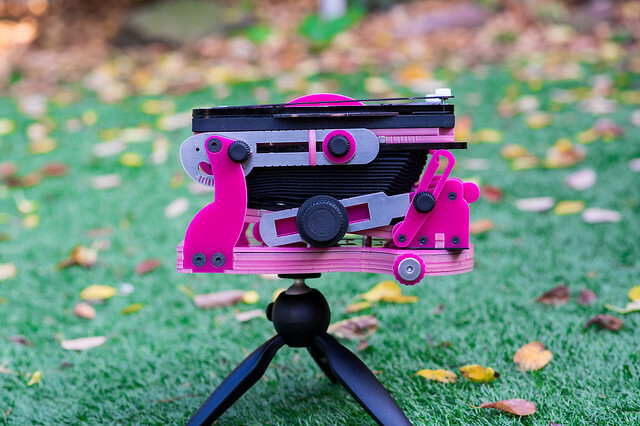 The Wunderlust Travelwide camera was produced using kickstarter money, monies donated by benefactors who then received a lightweight handheld 5x4inch camera. 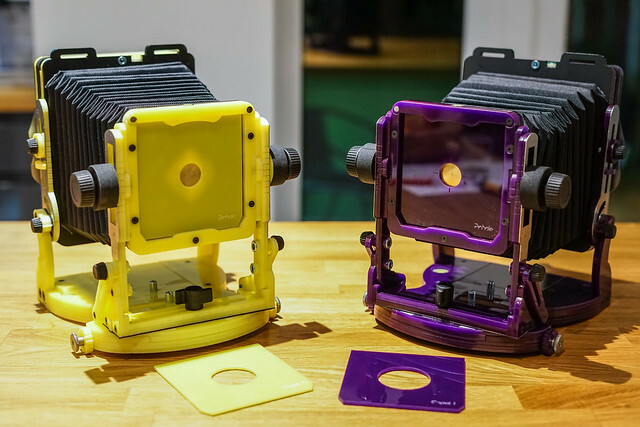 I was not one of these original funders (not being USA based) but I kept an eye open for funders who wished to sell their cameras afterwards on Ebay. It is a simple beast made of plastic with a plastic focusing helicord on which you added your own lens most notably a Schneider 90mm Angulon F6.8. This is what I used with my first Travelwide camera but my lens always vignette slightly whenever I used the lens at F11 or F16. It was passable at F22 but often the shutter speed then became too slow and the risk of camera shake came into action. I swapped this 90mm Angulon with a 90mm Super Angulon. This made the camera larger, the lens also made the camera feel a little top heavy but I used this combination successfully over a year or so. The lens was sharp at F11 and upwards. It then languished in a draw for a year and then I decided to sell it. 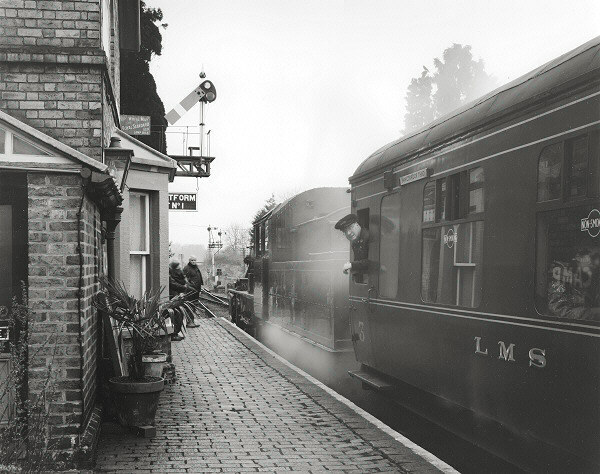 I was also less fussy with what I took photographs off, so the cheaper film size was used up quicker with ‘filler’shots. No saving at all. I then had the opportunity to purchase another Travelwide for a reasonable 150euro. It seemed a no-brainer although the seller did admit to the helicord focusing as being wooden. It wasn’t wooden, it was damn-well stiff, very, very stiff. It broke the connecting column which attached the helicord to the camera body immediately. 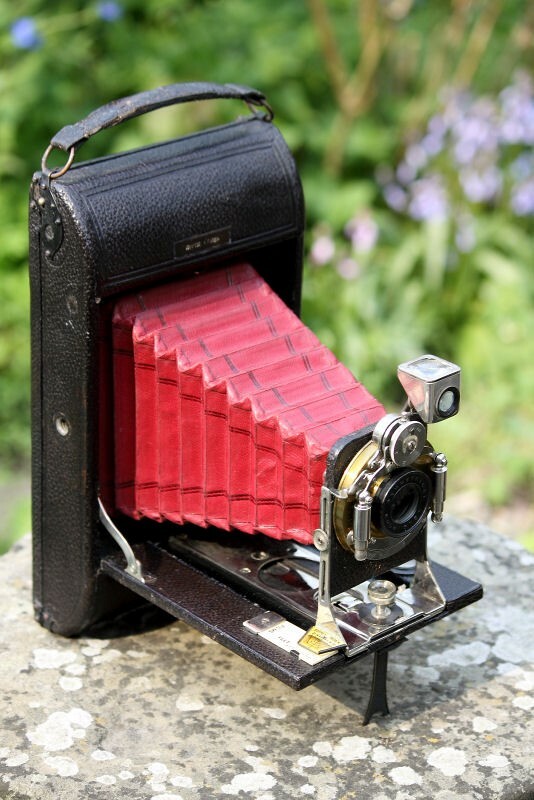 I then saw why the camera was cheap(ish) and even as a paperweight it was useless due to its lightweight! A waste of 150euro or so I thought. I was wondering what my next option was when I realized that I perhaps missing an opportunity here. I had read online forums that this focussing helicord was a common fault on many Travelwide cameras. (I must say my first Travelwide worked wonderfully). I looked through my other bits and bobs that photographers seem to hoard and found I had an old Mamiya camera lens from a Polariod 600 SE camera with a helicord mount. I then began fiddling around with this, removed the lens (an old 127mm with a non-working shutter) and set about attaching another lens (in this case a Fujinon-w 125mm in an old compur shutter from a Xenar 135mm F4.7 lens). I knew the lens would fit because the Mamiya lens was a copal 0. I then set about unscrewing and removing internal masks within the helicord as well as the original lens mount. About 20 – 30 small screws later all I had left was the simple helicord. I attached the lens with a retaining ring with a lens spanner. I put the lens/helicord to the body of the Travelwide. I messed around with elastic bands and got the lens unit in place temporarily so I could check the infinity focus and whether a 125mm wouldn’t be too long or too short a focal range. It wasn’t. I measured how much the lens unit had to protrude from the camera body and found it was an almost a perfect fit. All I had to do now was to attach this to the body of the Travelwide. With great good fortune I found with I used the focusing collar from the original helicord and the rubberised focusing ring (trimmed down by about 8mm) and glued together it would serve its purpose. 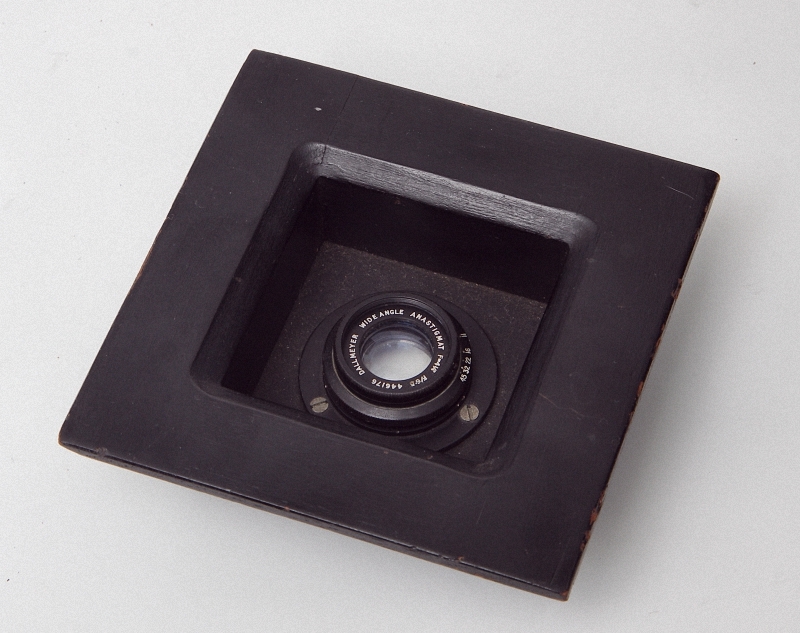 This was then epoxy-glued inside the lens mount of the camera body. The helicord then fitted snuggly within this (once the glue had set) and was also glued into the lens mount. I think I didn’t even necessarily have to glue this, it was an excellent fit and if I wrapped two elastic bands to the original polaroid mount of the helicord it seemed to stay there. I however wanted something a little more permanent and decided since I had come so far, I may as well glue the lens properly onto the camera lens mount. So this I did! The camera is, no doubt, larger than if I had simply used the original plastic helicord focussing mount and a 90mm Angulon F6.8 and indeed a 90mm Super Angulon F8 but with such a stiff helicord mount it wasn’t really an option (even with wax helping to loosen the focusing it was still too stiff and liable to break the retaining collar inside the camera). I also have a less angle of view with a 125mm lens instead of the 90mm – but this can also been seen as a pro. Sometimes a 90mm is too wide, especially for portraits. The depth of field on the Mamiya helicord isn’t spot on obviously but neither is it too far off. It gives a rough guide rather than perfect accuracy but again, this doesn’t bother me too much. I was surprised by how little the depth of field is different. If the 127mm Mamiya lens covered 3 ¼ × 4 ¼inch and the Fujinon-w 125mm covering 4x5inch there isn’t a massive difference. Again, as along as I’m carefully and err on the side of caution, I can use the depth of field lines on the helicord as well as avoiding the focus guesswork normally required due to the slowness of the Angulon lenses. 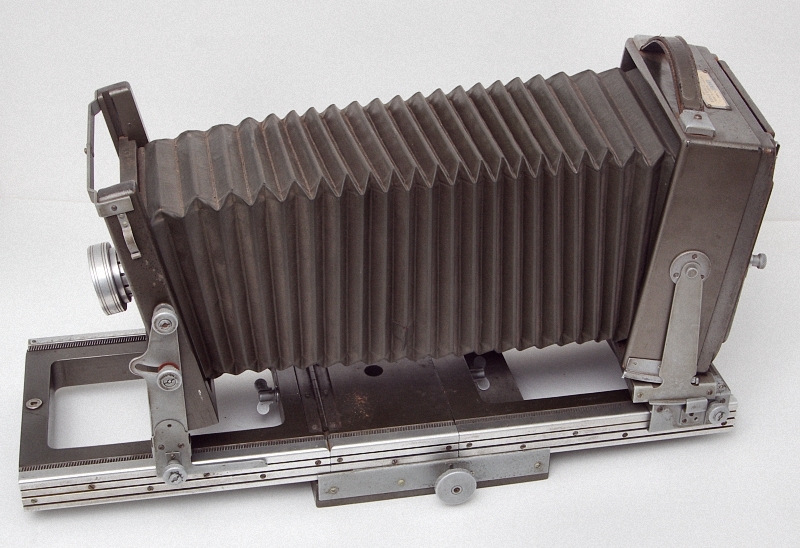 I have yet to add a fresnal screen to the basic camera ground-glass that comes with the camera. I am uncertain yet what option to take, maybe even try a cheap magnifying Fresnel and stick it to the back of the camera ground glass. We’ll see how I get on with this set up first. 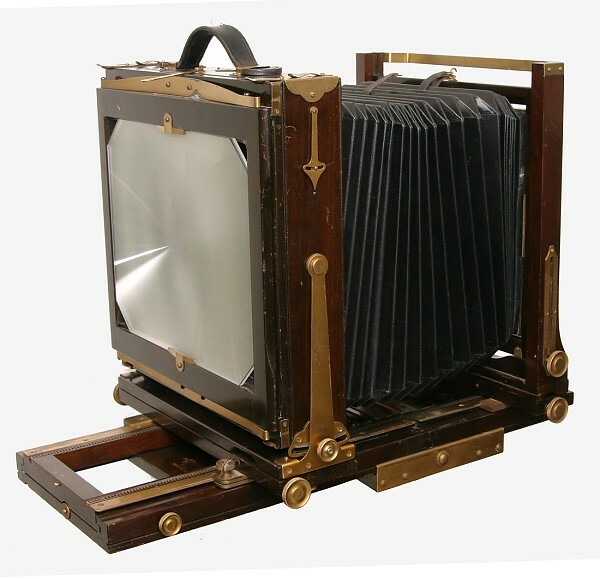 The original plastic ground-glass has a bright hotspot which to focus by and I find this adequate for my needs generally speaking. Mostly the helicord. It is firm and feels proper unlike the original plastic one. I have a little more confidence with this lens too. The F6.8 angulon is dark to focus by, and worse still was the F8 version. The funinon-w is a F5.6 and the bright spot on the ground-glass seems more than adequate for daylight images (which I only be using this camera for). The main pro however is I have not wasted 150euro and actually have a camera that is now a pleasure to use, that and an unusual focal length lens. 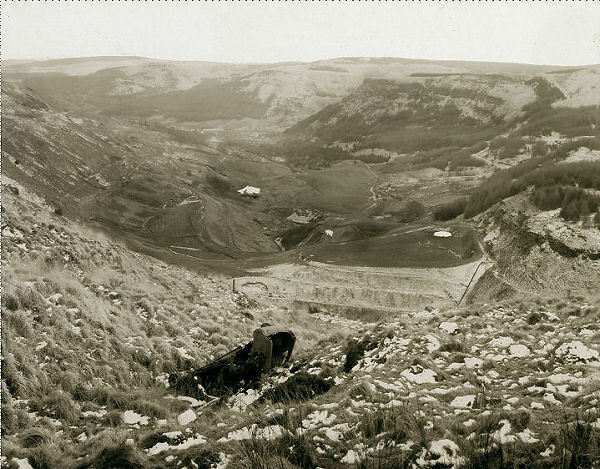 I will add images as they are processed onto this site. This, I know, will be the proof of the pudding! The epoxy glue will next be sanded down and then I'll either paint over with a matt black or possibly wrap a piece of black rubber around the rim of the camera body. It's a little unsightly at present. 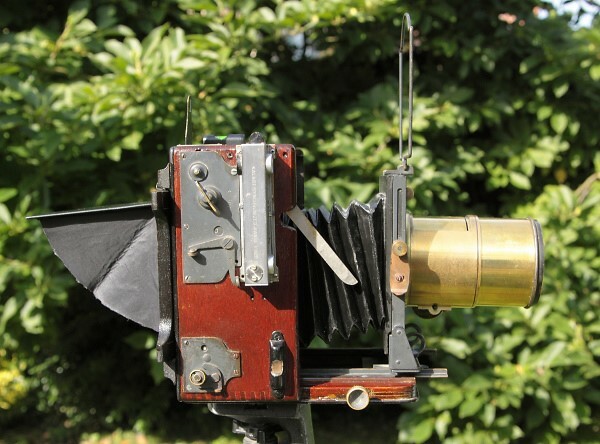 Same camera with a 5.75in TTH Cooke triplet, and new bellows. 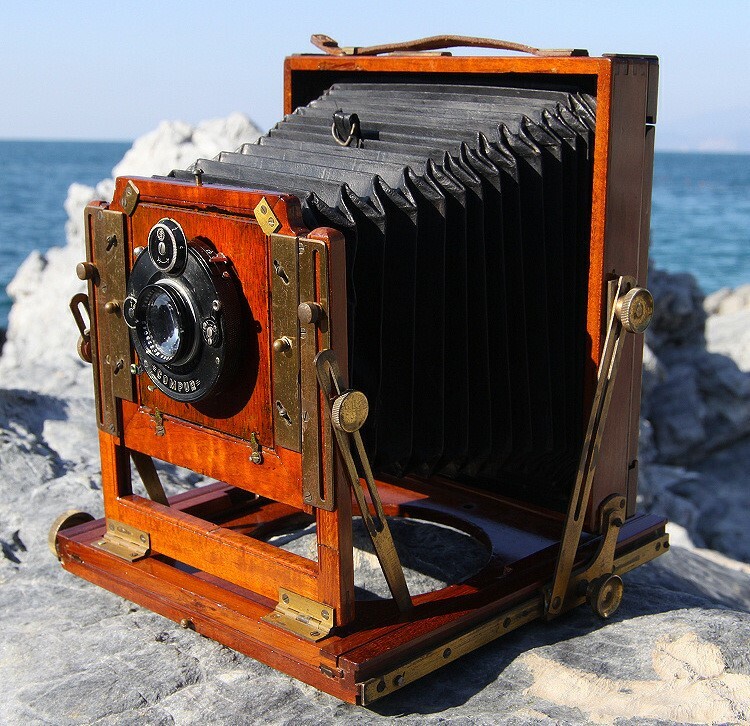 This camera was a basket case badly damaged and needed total rebuilding, shutter repair etc. Top of the camera is cut away to allow rise with a WA lens and the rangefinder is set for approx an 80-90mm lens possibly a Dagor as they have excellent coverage stopped down. 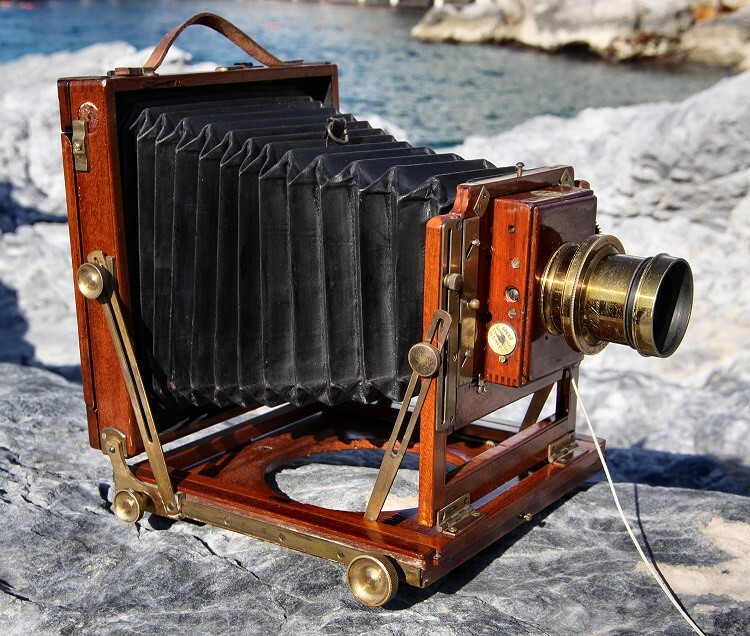 A rare camera made between 1898 and 1904 by The Alliance Roll Film Company Ltd, part owned by Houghtons, after 1904 badged as Ensign cameras. I have some aerial film I could slit if I find backing paper. 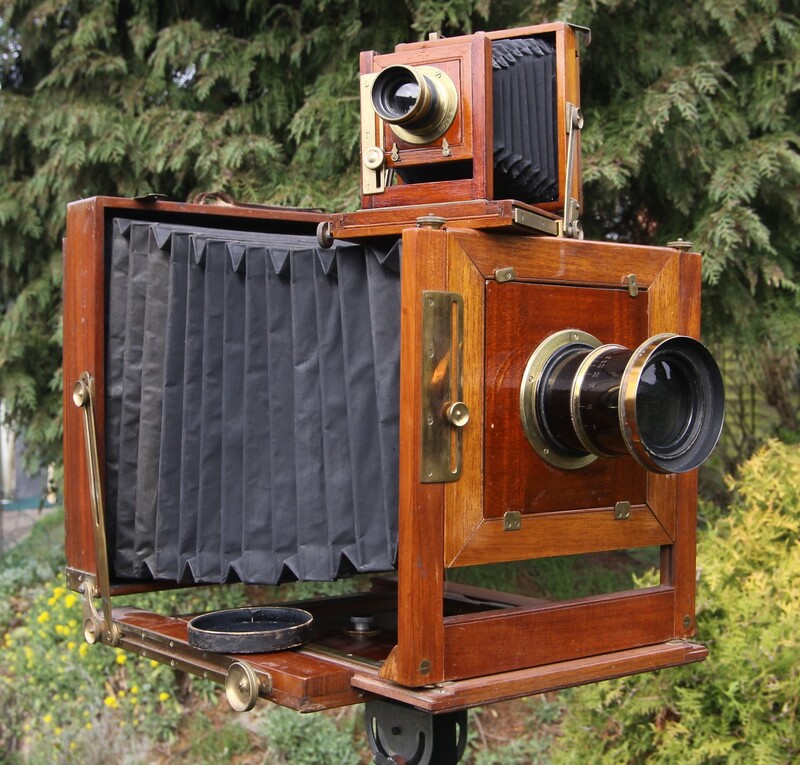 My 12"x10" camera with my firtst restoration (quarter plate). This will be used with Paper rather than film which will be reversal processed, unfortunately Ilford/Harman don't cut their Direct Positive papers to UK or Continental European sizes only US over 10x8. Camera itself is Unknown manufacturer,was £50 on Ebay. Not bad for £30 including a lens and tripod. The lens was useless someone had removed the shutter blades, just needs a replacement brass piece, I have some strips of the right alloy, and then new bellows. Ian, underneath the battered exterior that Gandolfi looks like a very nicely designed camera. And very nicely made too -look how the screw slots line up along the front. Beautiful figured Mahogany too. You can't get that anymore, unless you cut your great-grandmother's sideboard up. 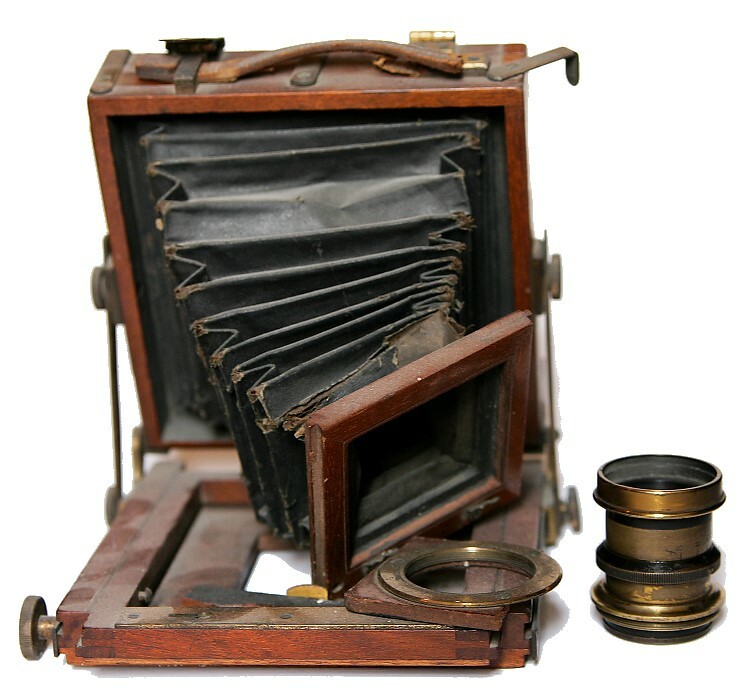 Will you make your own replacement bellows? Hmm great grandmas sideboard, no better not. 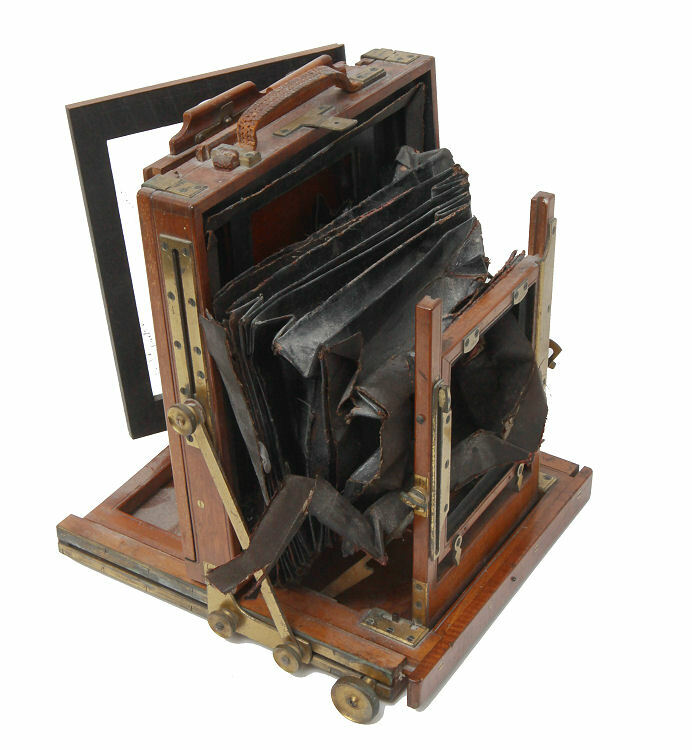 Yes, I've about a dozen sets of bellows to make, I keep putting it off. 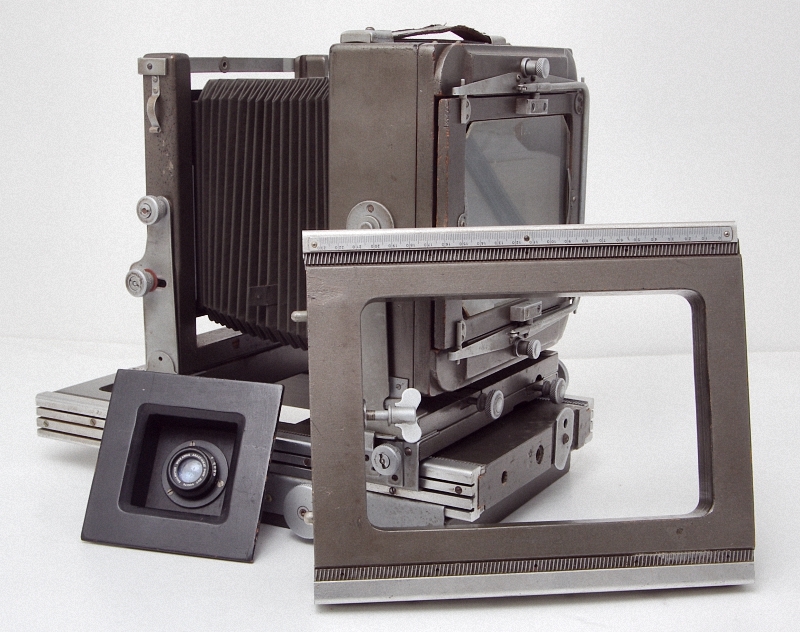 I've a few cameras sat restored just needing bellows and a quarter plate enlarger (5x4 as well if I had a second larger set of condensers). I've made bellows before, when you need a few sets it becomes too expensive to get them from Custom Bellows. 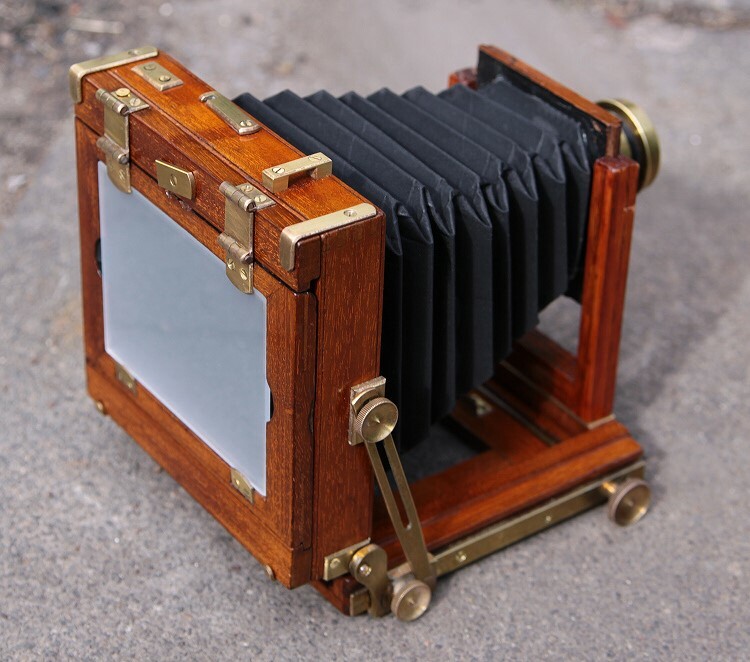 It was the same with Ground Glass screens, I needed ten so began making my own. That's the state I was given it in back around 1993 by an ex-girlfriend. I had to get a new front standard made, these days I'd make it myself. and with a more modern 165mm f6.3 Carl Zeiss Jena Tessar lens, I have an adapter plate to use modern 5x4 DDS, also original tripod legs. 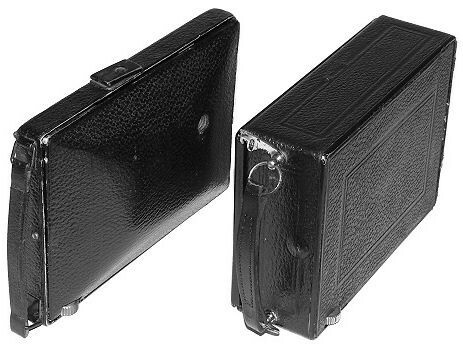 The 9x12 format is close to 5" x 3¾" and was the Continental European equivalent, this is the smallest LF camera ever made, much smaller than other German 9x12 cameras. Picked up my Kodak Specialist II on Sunday evening. 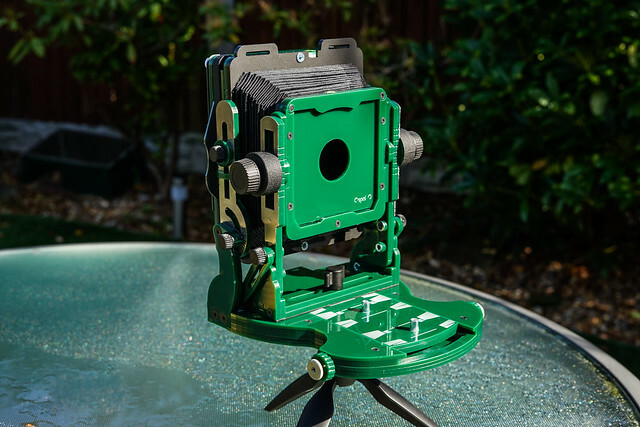 The camera came with the optional sliding tripod block. this helps with stability. 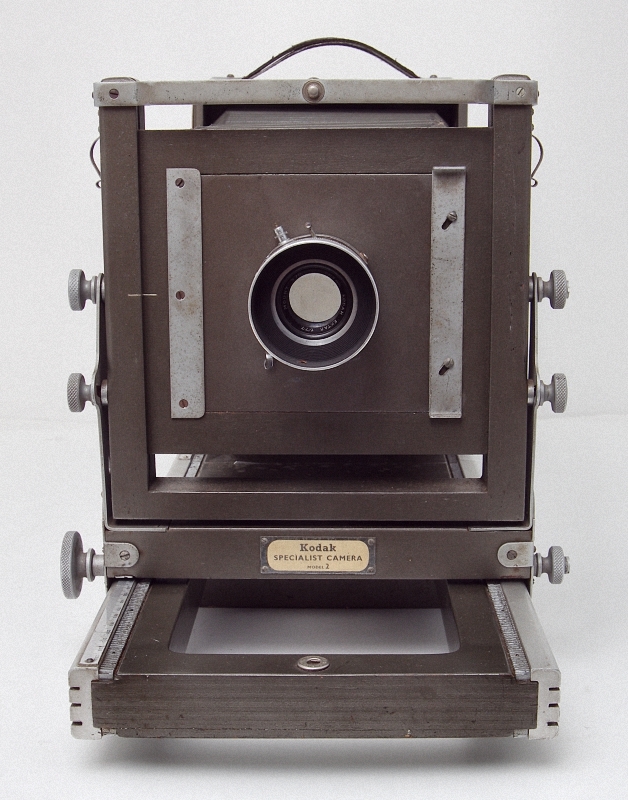 The camera came with a Dallmeyer 4¼" f6.5-11 wide angle lens which Kodak sold as an accessory. 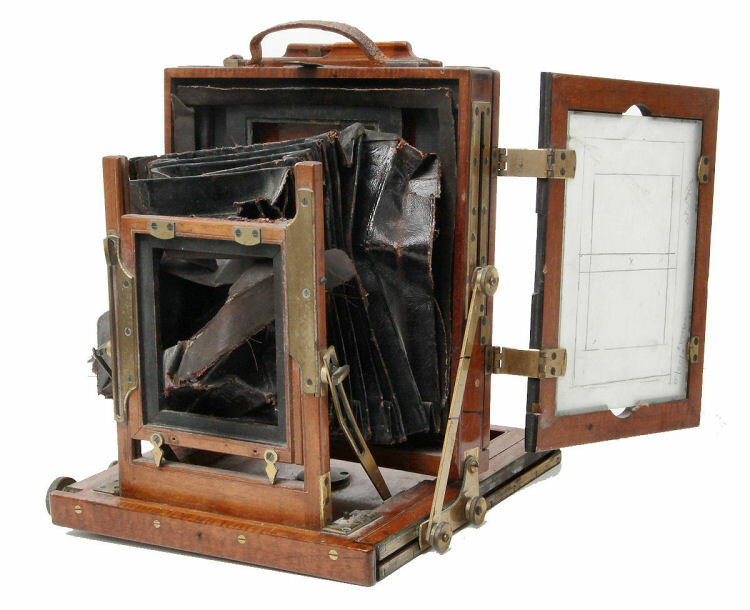 There's an original flight case and 6 half plate DDS film holders, however I have plenty of 7x5 DDS which are the same fit as well as film. I'm looking forward to using the camera. I have two 120mm lenses in shutters a 120mm f6.8 Goerz Berlin Dagor and a 120mm f6.8 Angulon. The Angulon covers 7x5 at all apertures, the Dagor when stopped down to f22. 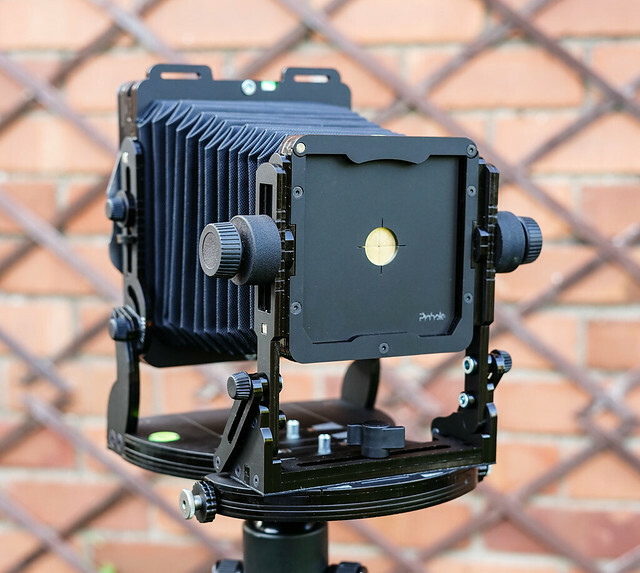 Not as lovely as some of the kit shown here, but this is my Intrepid 5x4. And this is my grandmothers Ansco No.3, which takes either 118 film (I've got 118/120 adaptors on their way) or 1/4 plate sheets. If the 120 film comes out OK I'll order some 1/4 plate film and see how that goes. 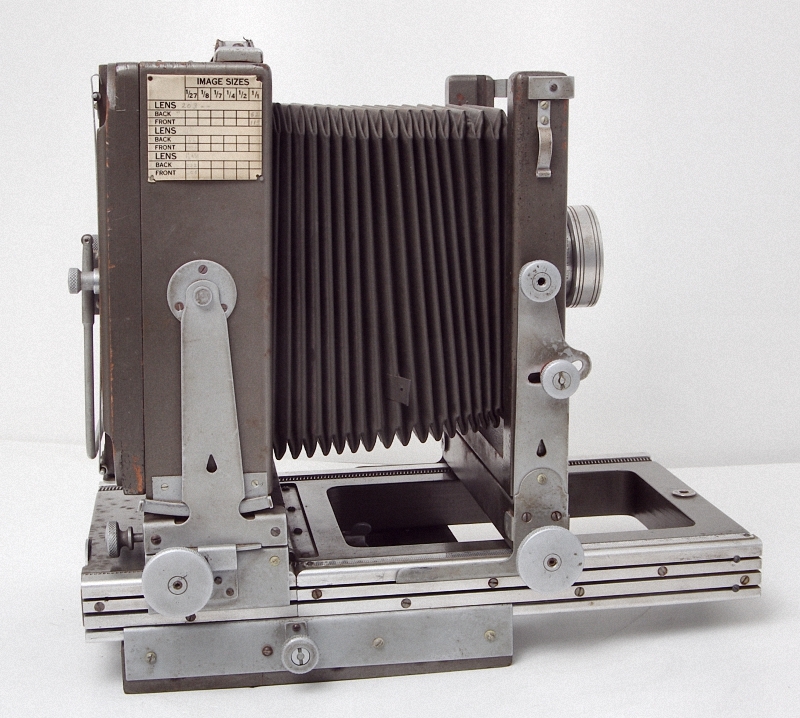 I don't think it's been used since about the 1950s but the shutter sounds OK. No idea about the bellows, nor how to source a replacement if they are shot. I had thought about cannibalising the lens and trying that on my Intrepid (accepting the vignetting), but then I stumbled across someone in Italy who makes adaptors to make 120 film fit into a 118 space (https://www.camerhack.it/shop/) so I thought I'd give it a go and see if it's still usable. 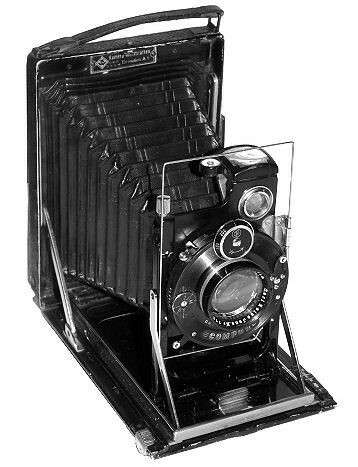 The lens of the Ansco would probably cover 5x4 but with no room for movements, after all it's designed for Quarter plate and some rise and fall. I assume it's around 135mm. 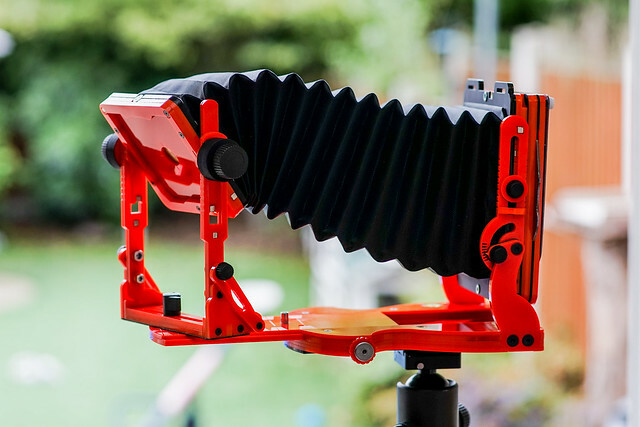 My Intrepid 5x4, this one is a Mk3. On location, shot with a film camera at the opposite end of the size range (an Olympus Pen-D half frame). My 10x8 Agfa Ansco Commercial View camera, I bought this around 15 years ago from a Photography Professor in Portland, Maine, the original owner had been a student then lecturer at the Clarence White School of Photograpy. 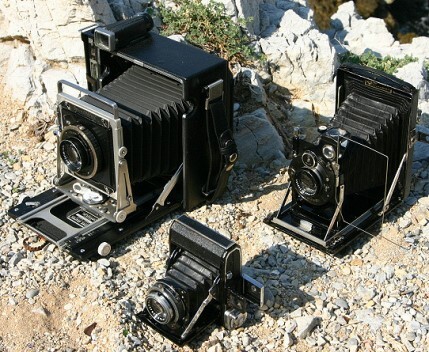 He'd bought what was in 1939/40considered the best US 10x8 cameras and lens - a 12" f6.8 CP Goerz AM Opt Daror. The 12" Dagor had been coated after WWII. 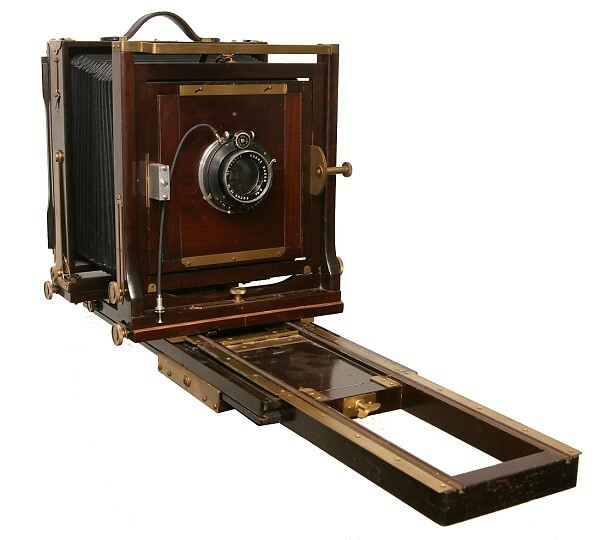 The camera has an extension rail, sliding tripod block and there's also built in rear extension as can be seen in the last photo, unusually the camera has front swing. Overall there's 36½ inches 993cm) of extension. The first image I made with the camera in January 2005, and one made 2 months later. 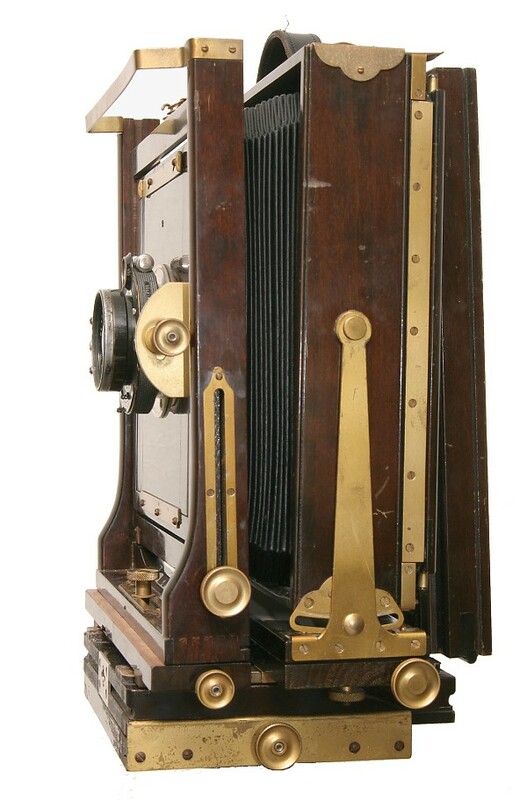 Could you tell us a little more about the table on the rear standard of the Kodak Specialist? 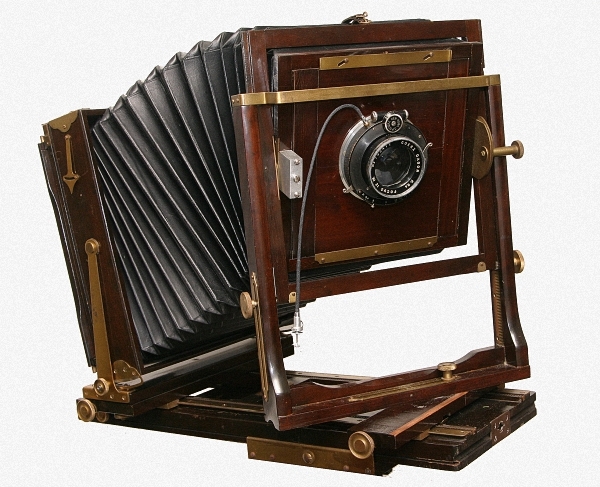 It's the positions of the front and rear standards and the lens extension factors from 1::27 to 1:1. Both sets of rails have accurate metric scales. Actually the tables a bit worn on my camera so difficult to read. I could replace it a friend had made parts like this with a laser etcher in the past if I supply an image file. I think the table is also in the manual so I could just make a card copy. 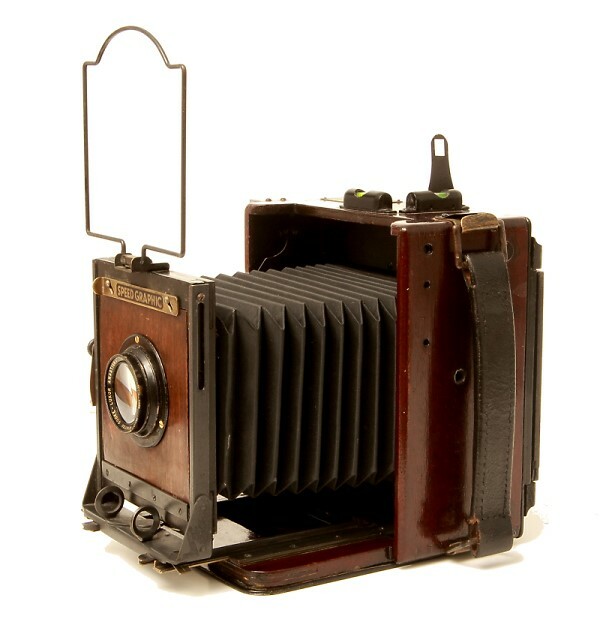 There was a clinical version of the camera and that included items to help quickly and accurately position the camera.